“I waited a long time to get into The Hunger Games as I thought that anything that was so popular couldn’t possibly be any good. I picked up the audio book of The Hunger Games, which is the first book in Suzanne Collins trilogy, when I finally just couldn’t stand not knowing what all the fuss was about and I’m glad I did. The title, The Hunger Games, refers to the book’s premise about an annual contest where a boy and girl from each of 12 districts are selected to fight to the death. These districts are controlled by the privileged city of Panam whose bloodthirsty citizens have turned the gruesome spectacle into the biggest entertainment event of the year. Our window into this dystopian world is protagonist Katniss Everdeen from District 12. Katniss is the archetypal strong female protagonist: She is smart, she has a special skill (bow hunting), and she is emotionally withdrawn. Luckily for us, Suzanne Collins has written the book as if we are inside Katniss’ head, so we get to hear all the things she would never say out loud and warm to her quickly. The choice of a first person style lends itself well to being read out loud and narrator Carolyn McCormick gives a wonderful performance, managing to inject a sense of the personality of each character into her reading, without going over the top. The final Hunger Games movie Mockingjay: Part 2 is due to be in cinemas in autumn 2015. 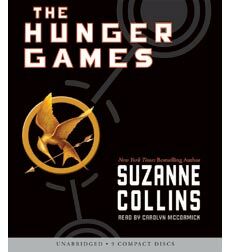 Whether you are new to Suzanne Collin’s epic adventure or would like to revisit it, you can reserve the audiobook The Hunger Games via the online catalogue. You can also make an enquiry next time you visit the Library. This entry was posted in audiobook, Authors, books, review, The Hunger Games and tagged audiobook, book review, The Hunger Games by adrienne12. Bookmark the permalink.